© KIRTILAL KALIDAS JEWELLERS PVT. LTD. Nothing enhances your beauty like a well-crafted piece of jewellery, and the expert craftsmen at Kirtilals understand that. If you’re looking to buy online diamond jewellery, then Kirtilals is the right destination as it is the most trusted shop for diamonds and diamond jewellery. Buy diamond jewellery online at Kirtilals and glow in the ethereal beauty of diamonds. If it’s gold that your heart desires, then choose from our wide range of traditional and contemporary jewellery set in the purest of gold, be it white gold, yellow gold or rose gold. Choose from among an exclusive range of gold pendants and diamond pendants at Kirtilals. With pieces to suit every occasion, our pendants collection of gold pendants and diamond pendants has both modern as well as contemporary pieces. 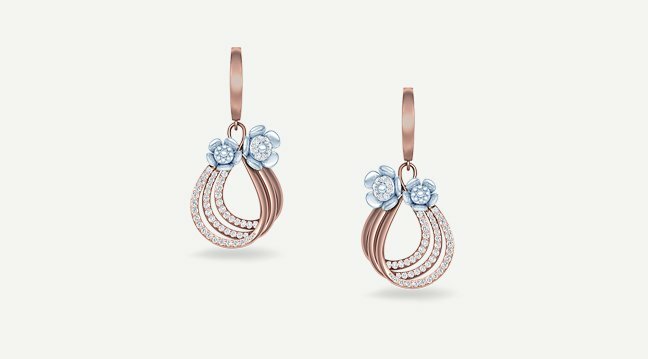 Among the most popular in the Kirtilals pendants range are the rose gold pendants and white gold pendants. Show off your slender fingers with gold rings and diamond rings from the house of Kirtilals. If rose gold rings and white gold rings are what you’re looking for, then you will definitely love the gold rings collection by Kirtilals. Looking for engagement rings Kirtilals boasts of an exquisite collection of engagement rings that are timeless, just like your eternal love. Accentuate your favourite outfits with gold necklaces and diamond necklaces, crafted with great care and expertise by the Kirtilals craftsmen. While the diamond necklaces by Kirtilals will add a touch of sparkle to your look, our rose gold necklaces and white gold necklaces will add a dash of class. If you’re planning to tie the knot anytime soon, you must take a look at the mangalsutra collection by Kirtilals. Gold earrings and diamond earrings add to a woman’s charm. Be it an office meeting or an important occasion, the gold earrings and diamond earrings in the Kirtilals collection are sure to make you the center of attention.Choose from a wide variety of designs, including hoops and diamond studs that will leave your ear lobes sparkling with their beauty. Kirtilals prides itself on its splendid collection of gold bracelets and diamond bracelets. These gold bracelets and diamond bracelets come in various patterns and are bound to leave your admirers spellbound. Adorn your wrists with a rose gold bracelets and white gold bracelet and watch the compliments roll in.